BIG Big Finish Week: Sherlock Holmes - The Hound Of The Baskervilles Review | Warped Factor - Words in the Key of Geek. And here we are at possibly the most famous Sherlock Holmes story of them all –The Hound of the Baskervilles. There are numerous film, TV and stage adaptations of this familiar tale and, as the interviewees in the extras on this Big Finish adaptation point out, even if you haven’t heard of anything else to do with Sherlock Holmes, you’ve heard of the Hound. So why adapt it again for audio. 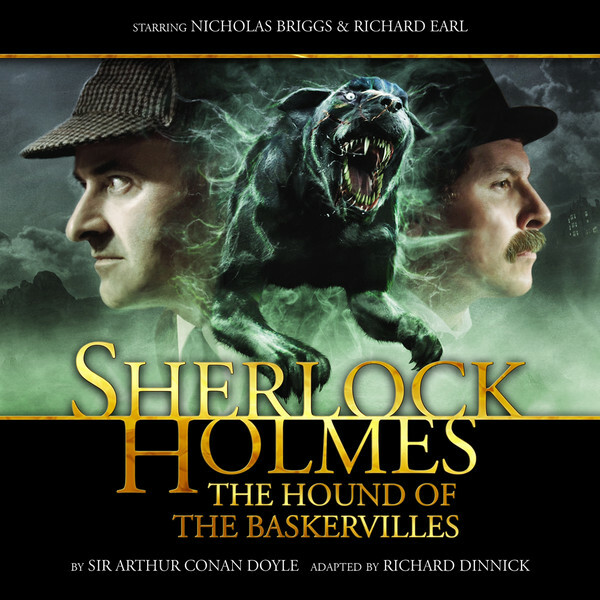 To be fair to Big Finish, it would have seemed like a oversight on their part if their Sherlock Holmes range didn’t, at some point, feature a version of Hound. As if in justification, Briggs is keen to point out in the interviews, that with this version they have tried to make it as authentic as is possible. Film, TV and stage adaptations tend to take liberties with the text: adding or removing characters; adding and removing scenes; changing motivations; even changing the culprit. The stage version I saw many years ago had Dr Mortimer recast as a woman (although, clearly to accommodate the members of the amateur group performing it rather than any convoluted story reasons). Ironically and amusingly, just after Briggs asserts how they have made this as authentic as possible, Ken Bentley (the director) comes on and says how they had to cut a scene from the novel because it didn't advance the plot in any way. The interviews are edited in such a way that Briggs's point is stepped all over. What Big Finish does is present the story as half ‘talking book’ and half full-cast play (although, again, Briggs is at pains to point out that is much closer to the full-cast play format than audiobook). Watson, the narrator of all Holmes’ exploits in the novels and short stories, has the lion’s share of this story narrating many of the scenes, even ones which could easily have been dramatised. This means Richard Earl has a huge amount of work to do as Watson; and very good he is too. Indeed, Hound is notable for the fact that Holmes actually disappears for a sizeable chunk of the action with the story following Watson to Baskerville Hall. This pushes Brigg’s performance as Holmes well into the background and, although he is perfectly serviceable, I wouldn’t say he has the chance to prove whether he deserves to sit in the same hall as Brett, Rathbone, Cumberbatch and, of course, Baker. The play is suitably atmospheric and the sound design evokes a foggy moor and echoey stately home well. The rest of the cast give good performances with John Banks and Sam Clemens (the son of the Brian Clemens –author of another BF Holmes audio, Holmes and the Ripper) being of particular note: Banks playing a wide variety of roles and Clemens giving a solid turn as Sir Henry Baskerville. Barnaby Edwards makes a great Stapleton. A couple of issues I have with the story are more to do with Conan Doyle’s original plot than anything Big Finish have done. Firstly, the fact that Stapleton and Beryl Stapleton are really husband and wife is fairly obvious as she is described as basically being Mediterranean in appearance, whereas Stapleton is noted as being fair and pale, and decidely English. This makes it rather hard to believe they are brother and sister as their charade requires. Big Finish have Charlie Norfolk perform her with a rather strong ‘Spanish-like’ accent which contrasts with Barnaby Edwards’s stiff upper lip, making it even harder to swallow the supposed relationship. My other gripe is the eventual fate of Stapleton. Holmes, before he has worked out their identity, states that the culprit is a worthy adversary for him, so it seems odd that Doyle never actually has him confront each other once Holmes realises Stapleton is responsible for the deaths and attempted murders. Holmes and Watson chase Stapleton across the moor and then, suddenly he’s gone – supposedly drowned in the bog. Listening to Watson describe this unseen scene was a rather anti-climactic way of ending the story. However, this is an excellent production from Big Finish and, along with The Speckled Band, shows that their talents do not just lie in Doctor Who. The next story they released, The Tangled Skein, is an unknown for me (unlike Hound, the story of which I was, obviously fairly familiar) and features Holmes meeting Dracula. After the evocative, although ultimately faked, supernatural elements of Hound, it will be interesting to see how a properly ‘fantastical’ figure such as Dracula fits into the rational world of Sherlock Holmes.